There is probably nothing quite as magical in the realm of pork as Chicharrones, or as many Americans call them: pork rinds or fried pork skins. 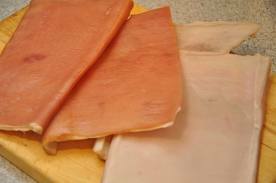 They start off as humble slices of pork skin - flabby, greasy, and virtually inedible. With a little hard work and patience they are literally transformed before your eyes into an ethereal, crispy, puff of porky goodness. For many years now, they've been packaged and sold in convenience food stores, often slathered in artificial flavorings. The truth is: they're not difficult to make at home, they taste better, and are infinitely more rewarding to eat. A healthy dose of sea salt and a cold pint of beer and you're ready to go! So get to your local butcher post haste, demand a few pounds of fresh pork skin, and get scraping! Unfortunately for those impatient types, several steps must be taken to achieve the light airiness that make them just so darn good. First, the proper skin must be chosen. After a few experiments, it seems as though thinner skin is a better option. Something from the belly area is best. Skin from the back or shoulder area is really too thick to give you the texture you're looking for in a good pork rind. Once you've gotten some good skin in your hands, it's time to start scraping! All the excess fat must be removed. The blade of a sturdy french knife seems to do the best job. Hold the knife nearly perpendicular to the fat and apply an generous amount of pressure. Hold one end of the fat in your left hand, scrape with the right. After a few minutes, you'll begin to see some light at the end of the tunnel. It does take some time though. Hang in there! Every last bit of fat must be removed for your chicharrones to come out properly. From there, you must blanch your pork skin in lightly simmering water for about an hour. It is important to add a little salt, white vinegar, and baking soda to the water. These ingredients will help to season/tenderize your pork skin. Next, cut the skin into a desired shape and size. You can also leave the skin in larger pieces and break it off once it's been fried. The pieces of skin should be laid out on some kind of rack so the air flow is able to reach all sides of the skin. 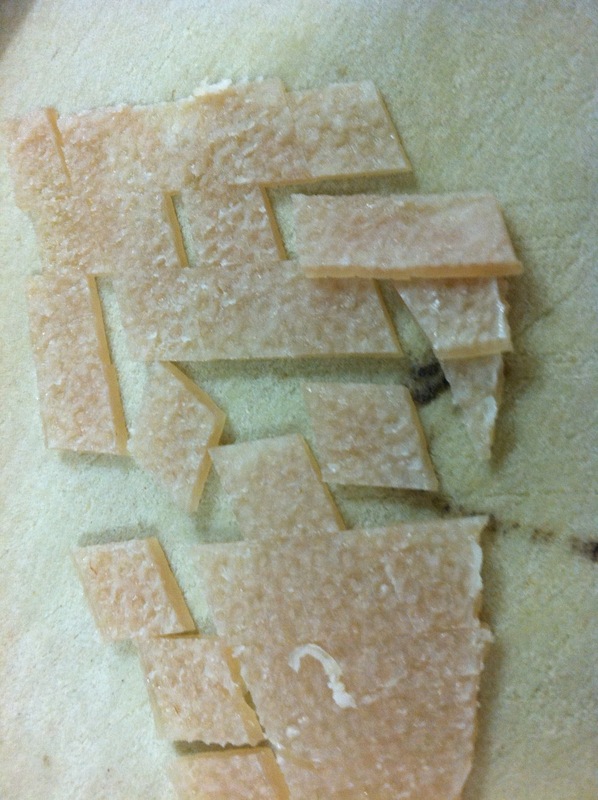 Dehydrate these pieces at 150 degrees F for about 24 hours. When finished, the dried pieces of skin will be much smaller, very hard, and nearly translucent - almost glasslike. The skin will keep in this state almost indefinitely. Keep it in a dry area. If they become too moist, they will not fry properly. Fry the skins in clean oil at 375 degrees F. Almost immediately after submerging, the skins will puff into the incredible pillows of pork that are chicharrones. Once all the bubbling stops, it means that all the air has expanded out of the skins, and they are ready to be pulled from the oil. Drain them on a tray with several layers of paper towels and sprinkle liberally with salt. And there you have it! Munch away! These little morsels are sure to be twice as tasty and at least three times as rewarding as the store bought skins. Just goes to show you what a little ingenuity and pork can create. Enjoy!